Just had the pleasure of dealing with Roger at VW Hull and I can back up everything I have read here. Top notch bloke. Courteous and helpful, worth the trip. I have an appointment with Roger on Tuesday to place my Tiguan order as well. luckily I have only a short journey from Leeds. I spoke to Roger but ended up placing an order at York. The Hull and York dealerships are both part of JCT600 group so offer the same discount. Saved me half the journey. Josh at York couldn’t be more helpful. So what model, colour etc did you go for then Olpk? The Teddy always is the deal clincher. 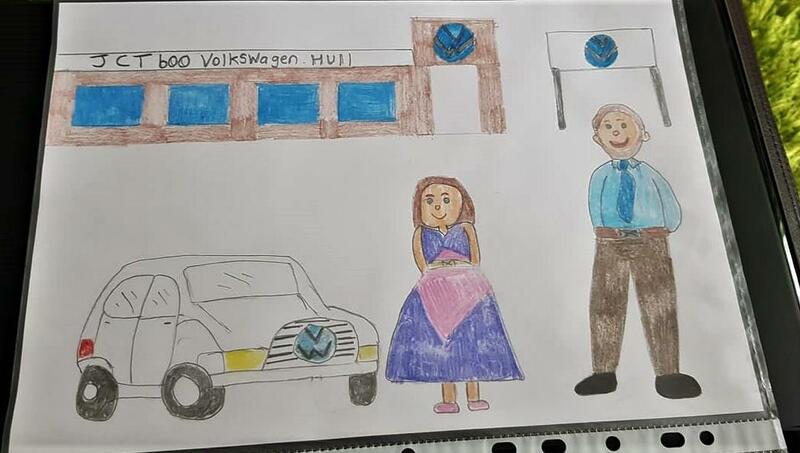 My 12yr Daughter draw a picture of her and Roger as it was her car we are getting, he involved her with his iPad picking the model, colour and spec. so in all one of the best experiences have had the pleasure dealing with in the last 10 years. so well done JTC600 Hull. Feeling the love in this thread guys…..a beautiful thing, thanks for posting. I ordered the Allspace 150tdi DSG 4motion in white. Options= leather, led headlights, winterpack with heated rear seats. The discount was applied as a dealer deposit contribution and NO upfront money from me. Balance to pay when car comes. That was key for me as my local dealers wanted all the options paid for on day of placing order. I’m glad you went and put the order in! Being 1st is Monday, I would hope to see some manufacturer websites update on the Friday, or weekend. Unfortunately VW always seem to be on of the last to update. I’m actively looking, just spotted Q2 pricing for the VW vans… it’s a start lol Updated on the Q2 pricing thread. Will tag you if i find the cars sooner than you. You’re on the ball ma man! is the all space made in Mexico? I believe it takes around 9 weeks just to get into uk once build, unlike the normal Tiguan is built within the EU. Just for information for all the people waiting on Tiguans – the VW order tracker is about as much use as a chocolate suppository lol! The AllSpace we ordered on 20 Feb ticked over to the Build Week confirmed a couple of weeks ago, but it doesn’t actually tell me what that build week is and live chat are no better, referring back to the supplying dealer. My advice would be periodically prompting them for an update. Russell, you are correct the AllSpace is built in Mexico and is shipped to Germany prior to ending up in the UK. At the time I ordered there had been a couple of strikes in the Ports handling the cars, adding to the frustration. 22 weeks turnaround seems pretty optimistic to me – even with a build date, as yet unknown!! Fortunately, we’re all ready on the Scheme so not really a problem – I’d be happy if it came in the Autumn. lol thanks for the feedback Bob, useful to get some first hand experience of the VW order tracking, or not as it may seem. I’ve been fortunate with my choices in the last 2 cars I’ve had have arrived within 3 weeks – both stock cars, 1 in a dealers, other in a holding area. I think you are correct, in that if you are already on the scheme with a vehicle that suits, lead times are less important compared to a new customer joining the scheme.